So I popped right up when my alarm went off this morning. I knew I needed to go change the laundry over for Trevor to have some pants to wear. I got up and did that, started a new load, scooped the cat box and then took my shower. Got out, got myself ready, woke the kids up, went out and got the pants, threw some new clothes in the washer and finished getting ready for work. A short time later Jess is looking for her softball uniform. She has a game today. Guess where the top is? Yes, in the washer. See, I should never try to be so organized, it just leads to problems! So I went out and found it in the very full of water washing machine. Brought it in, wrung it out, and told her to put it on the seat in her car under the window. She didn't think it was going to be dry in four hours but I told her she can just wear it a little wet then! Seriously, kid needs to get a wee bit more organized. So that's how I started my morning! Yesterday I left work just a little bit early and ran to Costco to pick up stuff for the baseball snack we were in charge of. Ran home and got them all ready, don't they look cute? (sorry blurry cell picture) I've found over the years it's so much easier to put the whole snack in a bag, that way you can just hand the player the bag and they don't have to try to juggle a bunch of loose things along with all their gear. 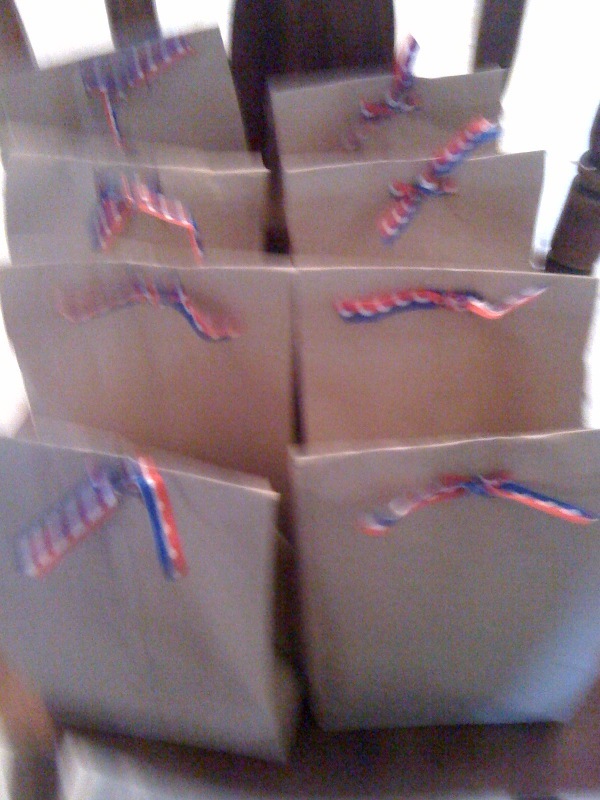 If I would have thought ahead I would have put a cute little baseball cut out on the bag. Hmmm next time. The game itself wasn't too exciting yesterday. The coach was amazingly quiet. Scott said maybe someone talked to him on Saturday because apparently he was anything but quiet then. He said he was doing A LOT of yelling. I'm glad I missed that game. The kids are pitching now too so that makes it so much better. Plus it feels more like a real game! It was super cold out there though, and an icy cold wind! I was so glad when it was finally time to go home. Look at this cute bag of stuff I got in the mail yesterday from Target. 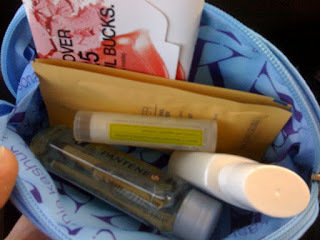 I'm pretty sure I signed up for this free stuff from Sara's blog. Or a link she put on Facebook. Whatever. Cool stuff for free, I'll take it! I started this post this morning and now it's 10pm and I'm finally finishing it. I ended up going out in the field today for work. 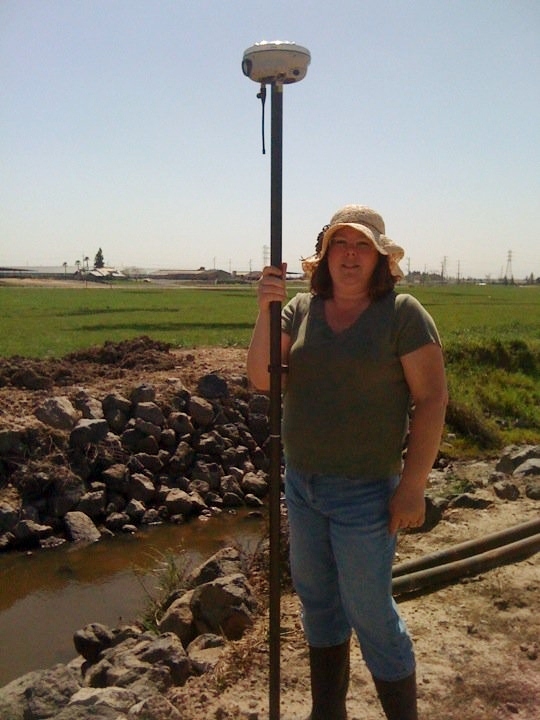 I wore rubber boots for the first time in my life and helped survey a really long irrigation ditch. We walked up and down it like 6 times. I'm slightly burnt. Look how cute I was though. Thanks to my co worker for the floppy hat. It actually doesn't look that dumb, might have to get myself one. My pants look all twisted though, must have been standing funny. By the way, that pole weighed about 20 pounds heavier the last walk down and back. As soon as I got home Trevor reminded me that I told him we could go get new shoes today. Lucky for me Melissa and Trevor both found shoes at the first store we went to. $80 plus for 2 pairs of shoes. They are so hard to find shoes they like that I don't even care how much it costs for the most part just to be done. Then we went to the mall to get something to eat and Jess met us there. Jess and Liss got their eyebrows done $30 plus. Then we went down to Target to get a few things and that was $50 plus. Crazy how fast the money goes when you have kids. Oh and I had to get some gas on the way home. $4.09 a gallon. I got $20 worth since I know it's cheaper by where I work. Gotta save some money somewhere! Have you ever worn rubber boots? What were you doing? I wear rubber boots in spring. Doing yard work in spring is the biggest. Also while walking the dog down at this park that is very wet and icky in spring. Rain and walking the dog....theme here huh? Take the dog to this equestion rehab pool to swim for an hour and it's a wet floor and we get soaked by the dogs so the rubber boots. Mine are a bit more colorful but they are rubber boats none the less. You look adorable! And ready to work! I just did the conversion of Gallons to Litres, and US$ to NZ$... our Petrol costs.... $8.31 US a GALLON!!! So if you think your's is expensive, try buying it here! You look lovely in your boots and hat! I know- I got my bag thingie from Target too!!! :) It'll be a good travel makeup bag for me so that rocks. And I wish I had rubber boots. They had polka dot ones at Target but yeah. nothing in my size. Whores. Soooo jealous of your FREE stuff!!! Love the pics!!! Awesome snack bags - sooooo cute!